I did this walk on Sunday 6th January 2008. 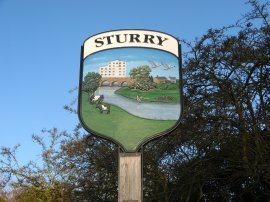 I drove down from Walthamstow to Sturry station from where I took the train to Chartham to resume my walk along the Stour Valley Walk. The single ticket cost me £2.70 and the journey took about 10 minutes. 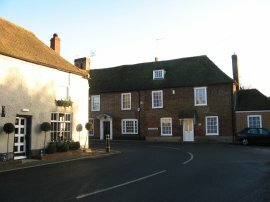 I had woken up quite early which meant I was in Chartham by 9:00am to start my walk. It had been a very pleasant drive down to Sturry watching the dawn slowly appear, the sun having eventually risen above the skyline when I was somewhere on the M2 near Sittingbourne. In marked contrast to the last time I was in Chartham a couple of weeks ago the weather was bright and sunny without a cloud in the sky and there was no wind. 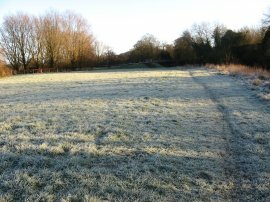 The still, clear, overnight skies had meant it had been very cold and all the grass was covered in a thick layer of frost and puddles with a layer of ice, photo 1. Leaving Chartham the route of the Stour Valley Walk follows the Great Stour River, photo 2, running alongside the riverbank down to reach the A28 Ashford Road. 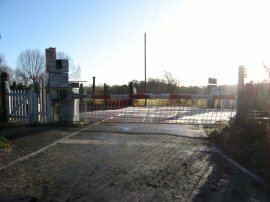 Here the route turns left along the road, crossing a bridge over some railway lines before turning right up Howfield Lane. 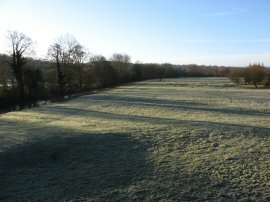 Photo 3 was taken looking back up the river in the direction of Chartham, the early morning sun casting long shadows across the grass. 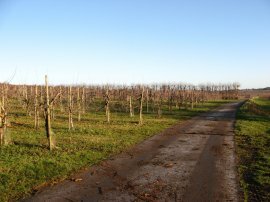 The route turns right along the driveway of Newmafruits Farms Ltd following the path round past a number of caravans and along a surfaced track that runs through apple orchards, photo 4. To the right of the path was a large lake and as I made my way along the path I could see the spires of Canterbury Cathedral ahead of me in the distance. 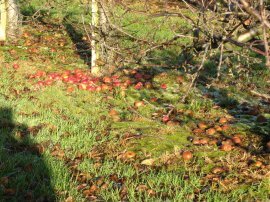 In a number of sections of the orchard it was clear that the fruit had not been harvested and the apple trees were surrounded by piles of apples in various states of decomposition, photo 5. Reaching a track by a house the route heads straight across, continuing along a muddy track that soon becomes a surfaced hedge lined footpath, photo 6, still passing through orchards as the route makes its way towards Canterbury. At the end of the orchards the route turns right, then left to take a subway under the A2 dual carriageway before turning right along a very minor road. This followed for some distance, passing over a level crossing, photo 7, before eventually reaching a car park on the right hand side of the road on the outskirts of Canterbury. 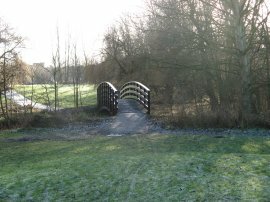 Here the route of the Stour Valley Walk turns right to enter an area of parkland, close to a children's play area. 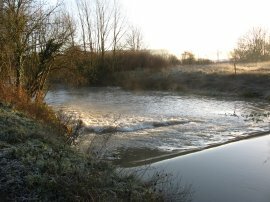 The route then crosses the Great Stour River (which at this point has split into two branches) over a wooden bridge, photo 8, before turning left to follow the riverbank into the centre of Canterbury. At this point I temporarily left the route of the Stour Valley Walk to start a walk around the Canterbury Centenary Walk. 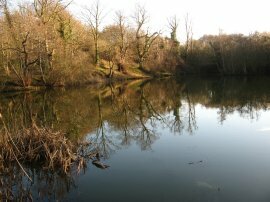 This is a seven mile circular route that runs between Canterbury and Chartham Hatch. Some two and half later that walk had been completed and I was back in the parkland where I turned left alongside the Great Stour photo 9, to recommence my walk along the Stour Valley Walk. The path passes under the road and continues ahead towards the West Gate, photo 10, through the Westgate Gardens which run along the riverside where I stopped to eat my lunch on a bench besides the river, surrounded by a large flock of opportunistic pigeons. In the park there was an unusual tree with an extremely broad trunk, photo 11. 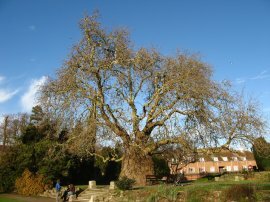 (I have subsequently discovered this is apparently a 200 year old and 25 foot wide, Oriental Plane (Platanus Orientals). 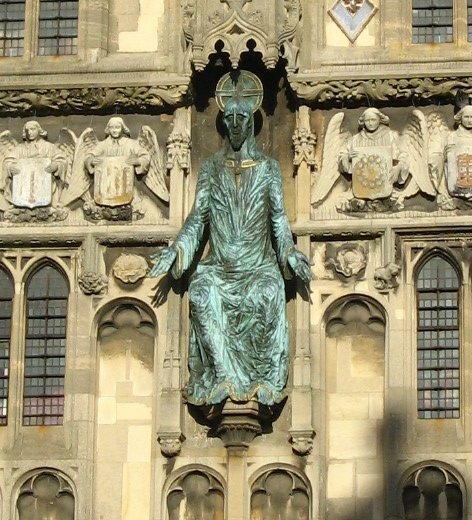 It is rumoured to contain a circular iron seat which used to stand around it!). Reaching the Westgate, photo 12, the route turns left heading along St Peters and on into the High Street. 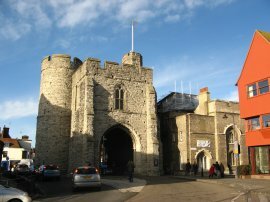 The West Gate is a massive medieval gatehouse in Canterbury, Kent, England. 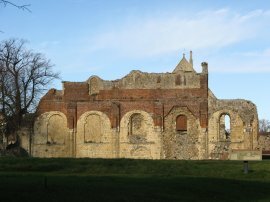 Built of Kentish ragstone in about 1377, it is still extremely well-preserved and is one of the city's most distinctive landmarks. 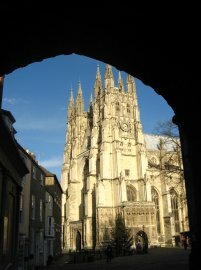 It is the last survivor of Canterbury's seven medieval gates and a much used road still passes through it. 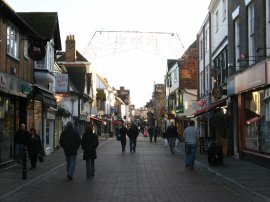 The High Street, photo 13, contained all the usual collection of stores, charity shops, restaurants and fast food outlets. Reaching Mercery Street I turned left to head down towards the Cathedral. 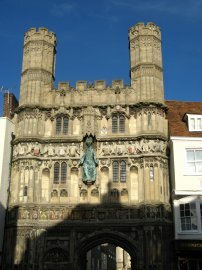 I had a quick look through the Christ Church Gate before heading off to my right along Burgate. It was a bit disappointing that I could not get a better view of the Cathedral, photo 15, without having to pay the entrance fee. 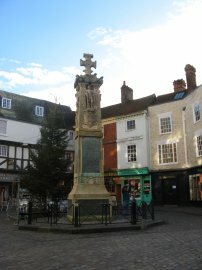 The route passes the war memorial in the Buttermarket, photo 16, then heads across Lower Bridge Street and into Church Street. At the end of Church Street I turned right for a few yards along Monastery Street before following the road round to the left into Longport, heading round the side of St Augustines Abbey, photo 17, although there is very little to see of this from the road. The route reaches Canterbury Prison and turns left up North Holmes Road. The route heads past St Martins Church and bears right into St Martins Avenue. This soon becomes a gravel lane and then a tarmac footpath, running between houses. 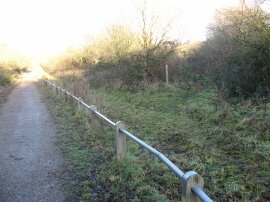 Here the route passes the remains of the Conduit House, photo 18, and continues along onto a muddy path that leads up to Chaucer Road. 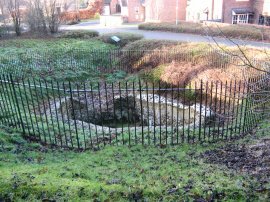 Conduit House is part of the monastic waterworks which supplied nearby St Augustine's Abbey. 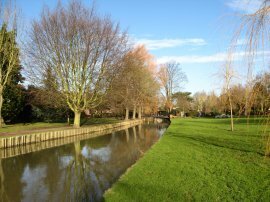 The Stour Valley Walk heads straight across Chaucer Road, leaving the suburbs of Canterbury. Heading past a radio mast the route enters a patch of scrubby woodland along a rather damp and muddy path. Reaching a track by some more open ground the route turns left. The route then joins a surfaced track and heads down past a large pond, photo 19, and continues on passing under some electricity pylons. 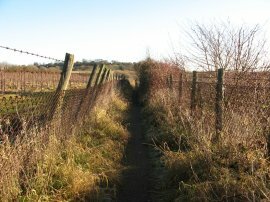 At a slight left hand bend in the track, just after the pylons, the route branches right along a grassy footpath, the footpath marker post can just about be made out in photo 20. The route crosses a track and heads under another overhead power line before entering the grounds of a golf course, this was rather unexpected as I had not noticed this before when looking on the map. Leaving the fairways the route heads then through a narrow band of trees before heading out into an open field, photo 21. 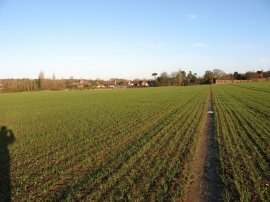 This was first open field I had encountered all day on this section of the Stour Valley Walk. Fortunately the path across the field was quite compacted and thus despite being damp was not too muddy or difficult to walk over. Reaching the edge of the field the route turns left along a farm track that runs down into the town of Fordwich, photo 22, where I left the route of the Stour Valley Walk for the day. 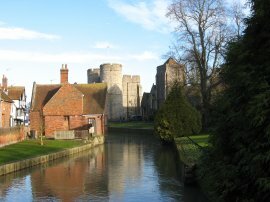 Fordwich grew in the Middle Ages as a port for boats on their way upriver to Canterbury and all of the Caen stone used by the Normans to rebuild Canterbury Cathedral in the 12th and 13th centuries was landed at Fordwich. Gradually though the Stour River, and the Wantsum Channel, started to silt up and the town has long since ceased to be, or even remotely resemble a port. Reaching Fordwich I had walked 6.85 miles along the Stour Valley Walk from Chartham. From Fordwich it was only about a half a mile walk up to where I had parked my car in Sturry, photo 23 and the total distance I had walked for the day was 14.2 miles. I am now nicely set up for the next stage, walking between Sturry and Sandwich as I near the end of the Stour Valley Walk.